Ahed Tamimi, a young Palestinian Arab woman from Nabi Saleh, a hamlet a few kilometers from our Jerusalem home ["17-Mar-13: A little village in the hills, and the monsters it spawns"] has been busy traveling and speaking to attentive crowds these past few months. the young woman many call Shirley Temper, a photogenic performer who for at least eight years now has been the central figure in a long-running propaganda performance orchestrated by her father Bassem Tamimi and his publicity business, Tamimi Press. Bassem Tamimi, Ahed's manager/father and long-time producer/director, asserted some months back ["Palestinian Ahed Tamimi 'banned from travelling abroad'"] that Israel was in some unspecified manner standing in the way of the post-prison globetrotting/meet-and-greets he had in mind for her. Somehow overcoming the Israeli opposition (if indeed it existed), the young woman, frequently referred to via overblown noms-de-guerre ("Palestine's Joan of Arc", "Ahed Tamimi, Palestinian protest icon", "I know I am a symbol of Palestinian resistance"), managed to pull-off a run of well-publicized visits to Spain, France, Tunisia, Greece and Jordan in September and October 2018. She also became the subject of a photo spread in the October 2018 Arabic version of Vogue magazine along the way. She's been busy. And the drum-beating and orchestrating have paid dividends. After years of wildly zig-zagging media estimates of her age [outlined here: "28-Dec-17: So how old is the Tamimi girl? "], there's little doubt she's now come of age and is an adult for all legal purposes (her 18th birthday was two weeks ago). This may become relevant if she repeats or enlarges on calls for more Arab-on-Israeli thuggery like those she made in front of her mother's Tamimi Press video camera ["04-Feb-18: The embarrassing violence of Ahed Tamimi and its fig-leafers"] a year ago. Mother took care to have the video very widely distributed. But surprisingly (alright, not so surprisingly as this excellent Forward piece by Shoshanna Keats Jaskoll points out), the fact that not-quite-adult Ahed Tamimi quite plainly called for real, physical violence has somehow become a point of controversy and doubt. It shouldn't have. She did it and it's on the record. 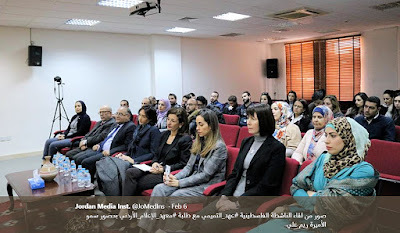 There's similar coverage in Jordan's Arabic media here and here as well as on the website of her hosts, the Jordan Media Institute. About that last entity, we have some experience (keep reading). Think about that. The mother seems to be boasting about the fact (and it is a fact) that she and husband Bassem Tamimi began grooming their daughter to be a fist-thrusting, slogan-spouting, angry-on-demand shrieking street activist and provocateur from when the child, already blonde and still somewhat Western looking, was a very vulnerable 8 years old. In most places, this would be justifiably viewed as child abuse and the parents as derelict and likely culpable criminally. Noot, of course, in those netherworlds ruled by the appalling Palestinian Authority and the no-less-horrific Hamas. Ahlam Tamimi returned the favour a year ago ["05-Jan-18: In Jordan, the FBI fugitive Ahlam Tamimi pays tribute to her slapping/taunting/kicking Tamimi cousin"]. Standing before a Jordanian audience, flanked by Jordanian dignitaries including a former Jordanian prime minister, she praised Nariman's daughter Ahed Tamimi who had been detained by Israeli authorities (as was Nariman) some days before. Both were facing charges and an Israeli prison sentence. Somewhat vaguely (based on the reports we saw), Ahlam Tamimi congratulated Ahed Tamimi for "breathing new life" into the cause of female prisoners and children prisoners. 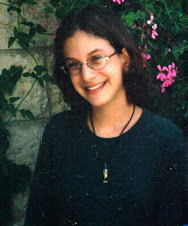 Most readers of this blog know Ahlam Tamimi ["17-Nov-11: A monster walks the streets and she has many accomplices"] confesses repeatedly, publicly and with evident pride to being the mastermind of the 2001 Sbarro pizzeria massacre where 16 innocent Jews, among them our daughter Malki, were killed. 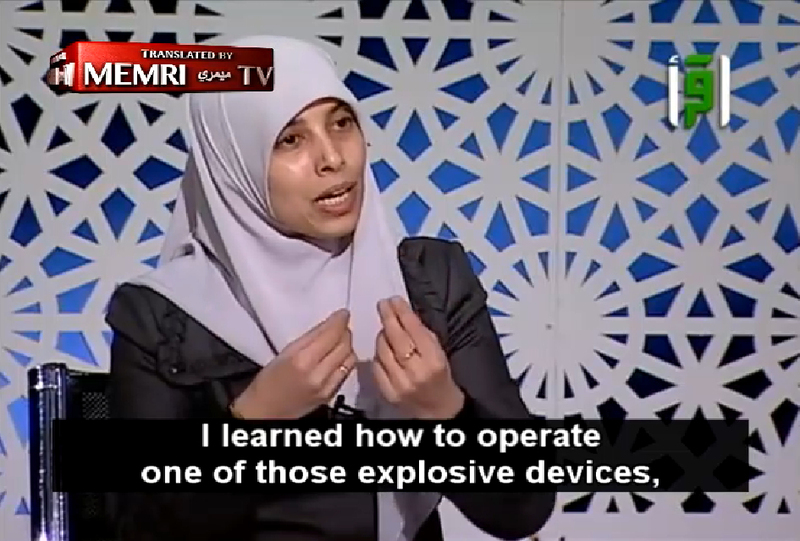 Ahlam Tamimi was serving a prison sentence of 16 consecutive life terms right up until the catastrophic Shalit Deal that Israel transacted with Hamas in 2011. That's when she was freed and returned to the land of her birth, the place where most of her family lives and where she was raised. We have written hundreds of blog posts and op eds about Ahlam Tamimi, born in Jordan and living there today, not in hiding but out in the open. She has become a genuine celebrity ["24-Nov-18: How Jordan's mainstream media showcase a couple of role-model jihadist murderers"] who speaks often in public forums and on Jordan's media. But (or perhaps and) she is a fugitive from the FBI, charged by the US Department of Justice with Federal crimes and with a State Department $5 million reward for her capture and conviction. 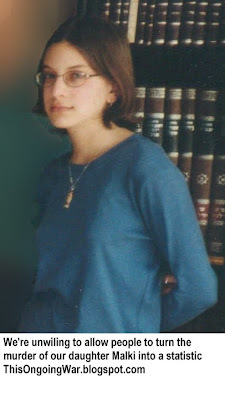 She is the subject of an extradition request which the Jordanian government, for narrow and technical reasons, has rejected ["20-Mar-17: The Hashemite Kingdom's courts have spoken: The murdering FBI fugitive will not be handed over"]. The US and Jordan have a valid extradition treaty that has been in effect between the two countries since 1995. Several Jordanian felons were extradited to the US before the Tamimi case. 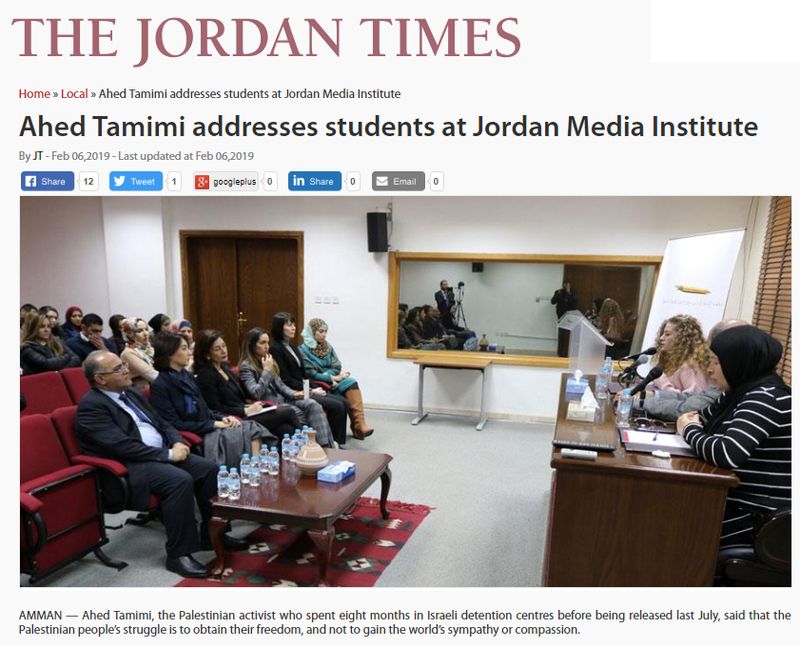 It's interesting to us that of all the possible Jordanian venue options, Ahed Tamimi was a guest last week at the Jordan Media Institute. It's also striking that Princess Rym Ali, the JMI's founder and a former CNN on-camera reporter before she married into the Hashemite royal family, was present to hear her speak, seated in the front row (see the photo above). To us, this seems odd. Ahed is no Jordanian. And most other Jordanian royals seem to have wisely taken care not to get entangled with the outstandingly problematic Tamimi clan. Perhaps some enterprising journalist will take the trouble to look into what about the Nabi Saleh Tamimis' violent bigotry that so attracts this royal attention. At this point, allow us to mention that we have had seriously disturbing experiences with the JMI and the unique interplay of professional aspiration and tolerance for extreme violence that we believe the school represents. We're referring to how we discovered four years ago, and then did our best to publicize, that the very privileged students of this prestigious and hugely-needed institution had publicly declared Ahlam Tamimi - the boastful Hamas agent who set out to kill as many Jewish children as possible and succeeded - as their "success model". We ended up persuading several of the school's international funders, including a number of governments, to terminate their support. But we never succeeded in (a) getting the school's management to respond to us other than rude and pointless response from a manager there, or (b) to be open about what we had reported. Their preference was to engage in a rather shabby and pathetic cover-up. 11-Dec-14: Is it newsworthy when journalists make a terror-addicted murdering colleague their role-model? What happened at the Jordan Media Institute and the scandalous way it was hushed up by management ought to be factored into people's thinking when they wonder about the state of democracy, human rights and terrorism in the Arab world. Given the strange role played by an ambitious school like JMI, this seems a good time to be thinking about how very badly journalism serves the Palestinian Arabs (the vast majority of Jordanians self-identify as Palestinian Arabs). And the difficulties their reporters and their editors encounter under the thumb of the powers that be. It is disingenuous because it is coming from Hamas -- a group for whom the terms objectivity and accuracy are wholly inimical. It is laughable because it allows Hamas to set the standards for objectivity and accuracy... For Hamas, objectivity in the media means that journalists shut their mouths about their leaders and government officials. For Hamas, "accuracy" means that a journalist working in the Gaza Strip will show Israel and the Palestinian Authority in the worst possible light -- regardless of the facts. Since the beginning of this year, the Palestinian Authority security forces have arrested 10 Palestinian journalists in the West Bank for their "negative" reporting and alleged criticism of Abbas and other senior Palestinian figures... 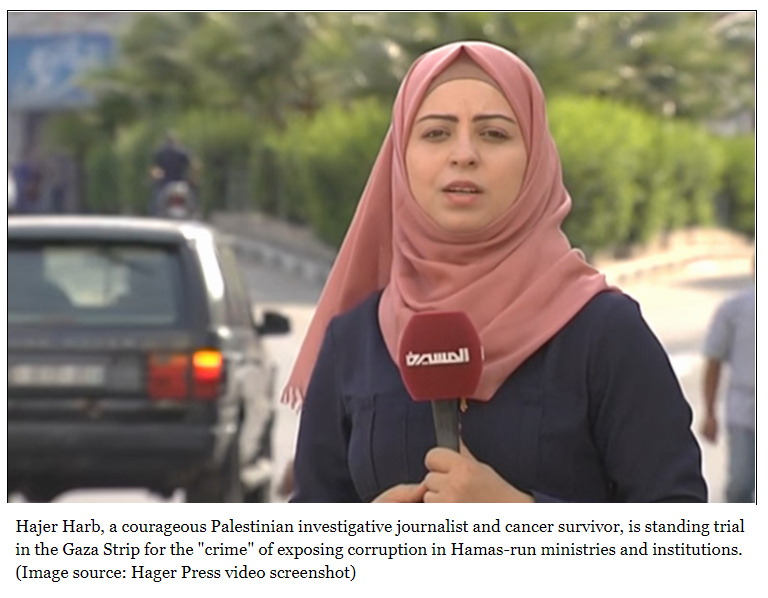 The Palestinian Journalists Syndicate regularly chooses totally to ignore the plight of the journalists arrested by the Palestinian Authority security forces. The only evils the Syndicate sees are those that can be linked to Hamas or Israel. That is because its heads and senior staff are affiliated with Abbas's Fatah faction... Like Hamas, the Palestinian Authority, with the help of its associates in the syndicate, is apparently seeking to control the news and narrative to make sure that journalists direct their criticism only against Israel. Like Hamas, the Palestinian Authority has been relatively successful in its effort to limit the flow of information from areas under its control. A Palestinian journalist living in Ramallah will think at least a dozen times before he or she writes or says a word that could rile Abbas or one of his senior officials. A great shame that all those 'activists' agitating for 'Free Palestine', for BDS and for "Palestinian rights" don't direct their energies, criticisms and fury at the two ham-fisted Palestinian Arab regimes that bear almost all the responsibility for what's wrong with the lives of the people living under their boots. Also a great shame that the Ahed Tamimi phenomenon continues to get so much unjustified backing in parts of the Arab world where a little more inward-focused retrospection would do so much more for the problems that beset their lives. 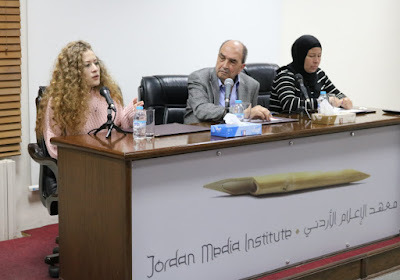 We just came across the Jordan Media Institute's two tweets of last week's Ahed Tamimi event currently here and here and here with a half-hour video of Joan-of-Arc's customary flat/monotone speech (and archived here and here and here in case... you know). 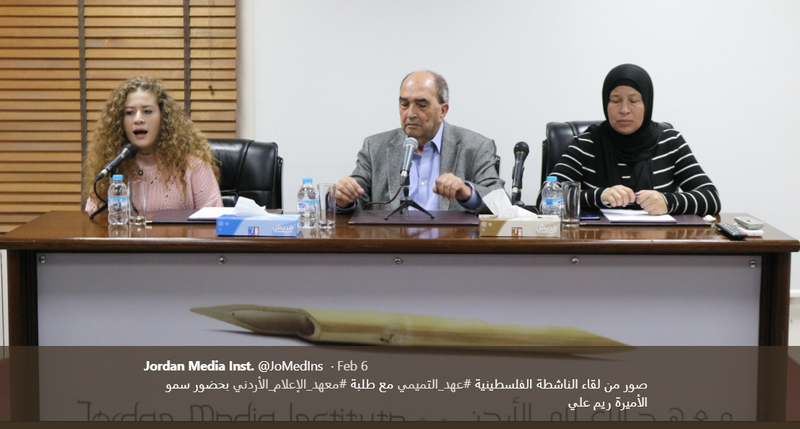 The JMI photos make apparent that Nariman Tamimi, mother of Ahed, cousin and outspoken fan of Ahlam Tamimi and her hideous deeds, is seated at the head table. 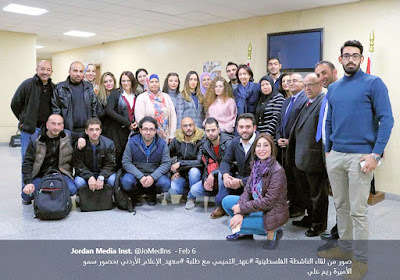 Also apparent: (a) that Jordanian journalism's best and brightest don't at all mind being associated with the terror-loving Tamimi clan's messaging - which if you pause to think about it is staggering; (b) the scandal of 2015 which cost the school some substantial foreign funding is dead and forgotten; (c) the illustrious Jordan Media Institute is mighty proud that the Tamimis allowed them to give a platform to Ahed.